Cloud-only mode makes it possible to run a CloVR VM without ever downloading the CloVR VM and running it locally. 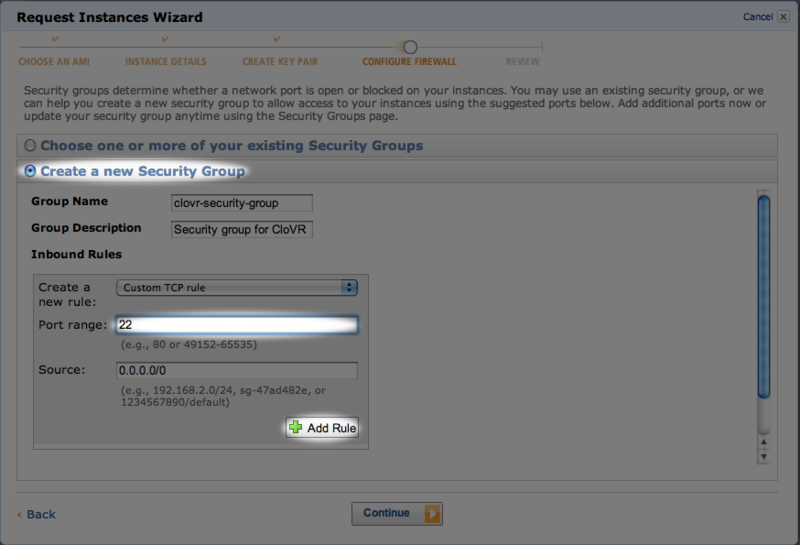 Instead, a CloVR instance is run directly on the cloud. This allows users to start using CloVR quickly. One must be cautious when using cloud-only mode though, unlike clusters started from a local broker, cloud-only mode instances will not automatically terminate themselves and must be terminated by the user manually. 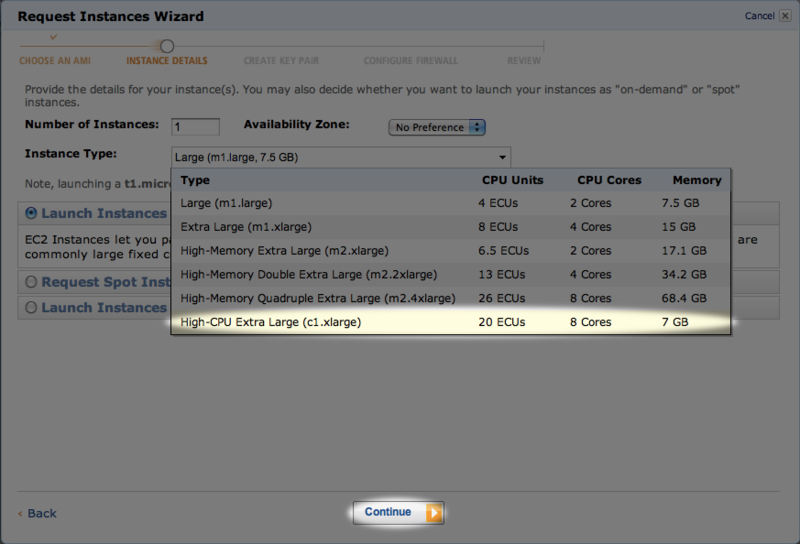 This guide will cover running a cloud-only instance on EC2. Once signed in, you should get a screen that looks like the following. 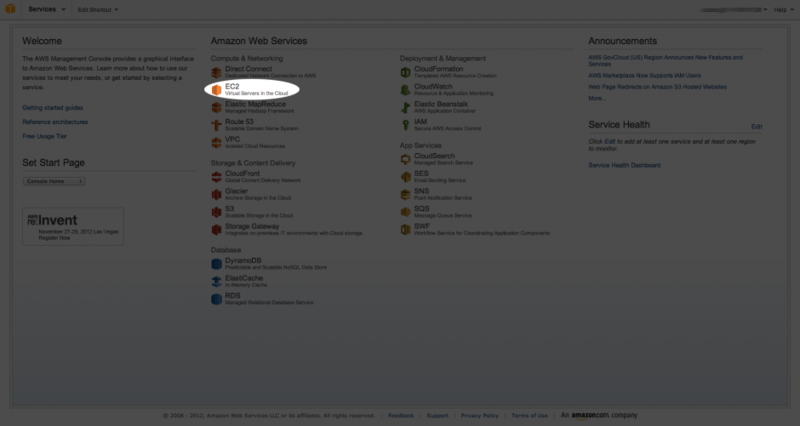 Click on the EC2 link. 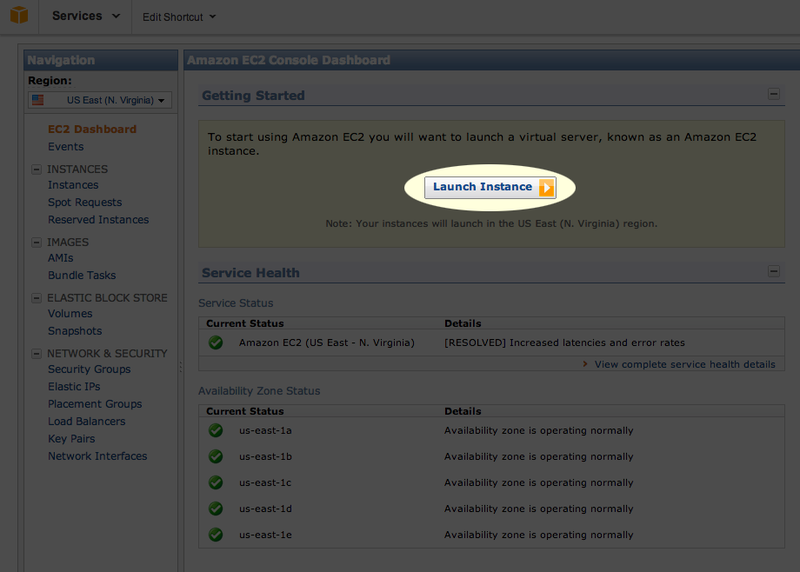 Click on the Launch Instance button. 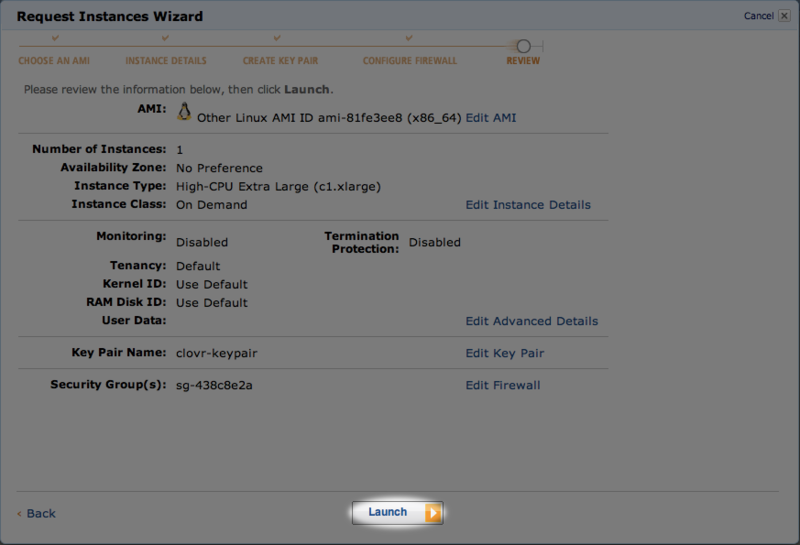 Seelct the Classic Wizard options from the pop-up window and click Continue. You must find the AMI you wish to run. 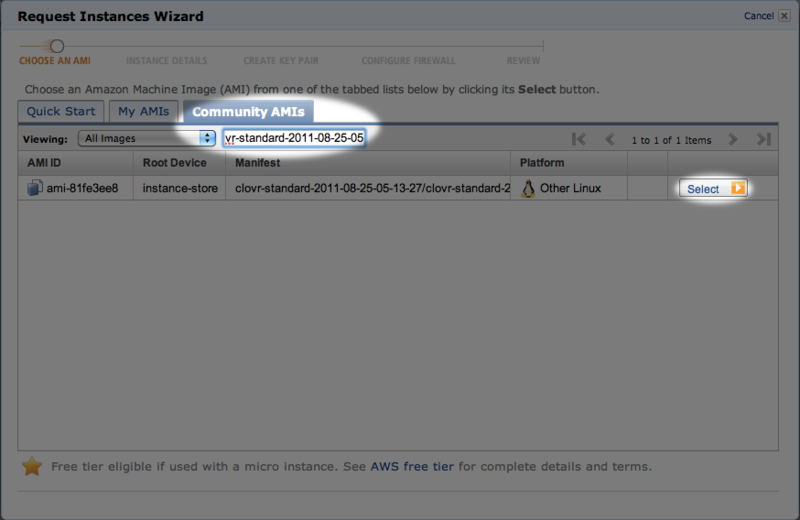 Click on the Community AMIs tab and search for the current version number of the CloVR VM. Then click Select. No changes need to be made on this page, just select Continue. No changes need to be made here, select Continue. No changes need to be made here as well, just select Continue. 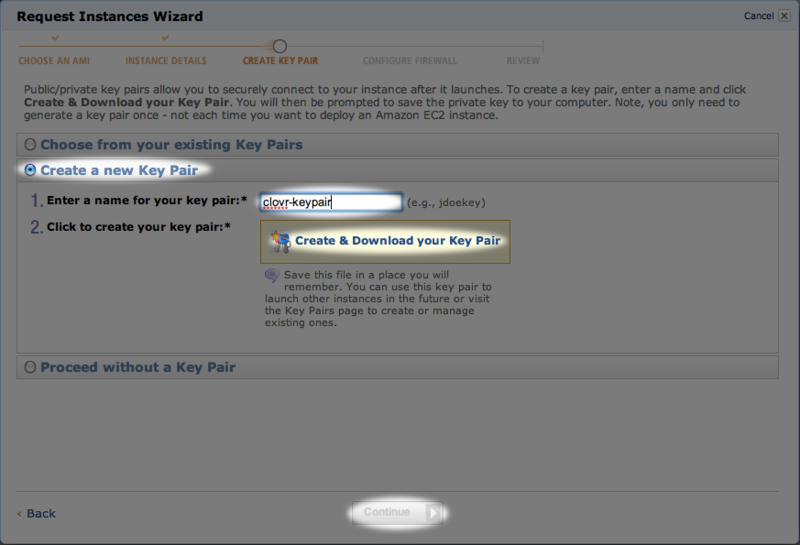 If you haven’t already created a keypair, create one here simply by giving it a name and download the pem file. Be sure to save the pem file to a location you can find later. It will not be used in this guide, but it can be useful for troubleshooting. If you need to, you can ssh into your instance using this pem file. Now create a security group. Give it a meaningful name and you will need to add two ports to it. 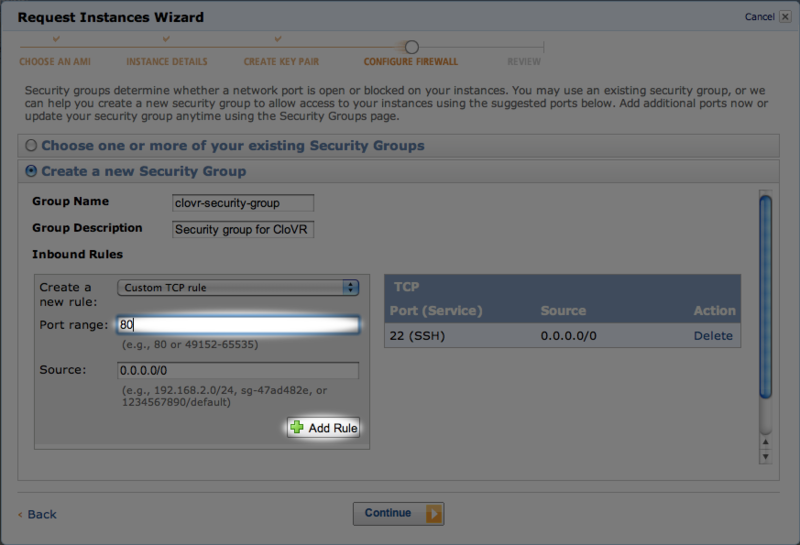 First add port 22 and click Add Rule. 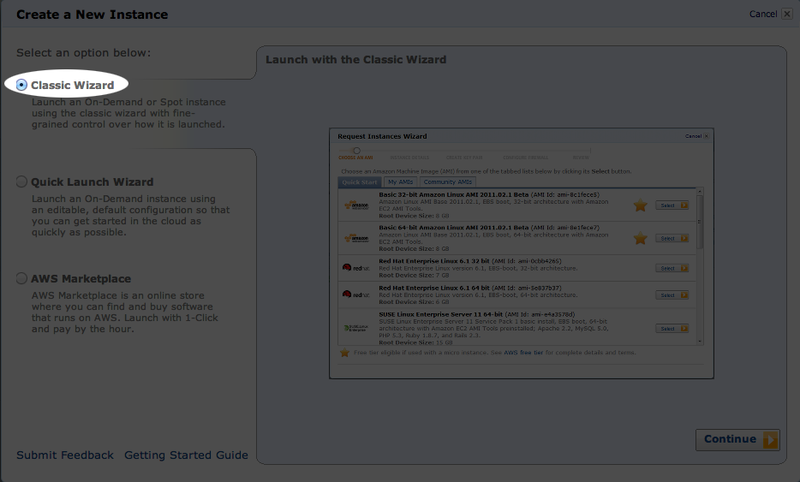 The instance has been properly setup now, click Launch. 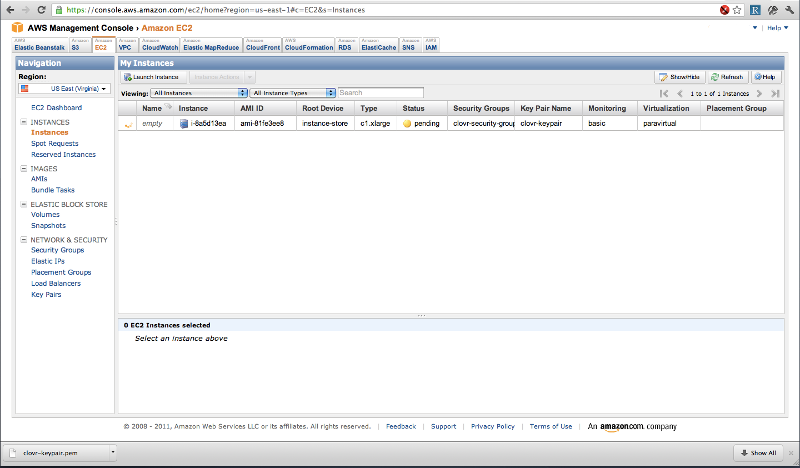 Upon clicking Launch a list of active instances will be shown. It will start in a pending and if everything goes correctly will move to a running state. If something goes wrong it will go into a terminatedstate. If this happens, simply go through the previous steps again. 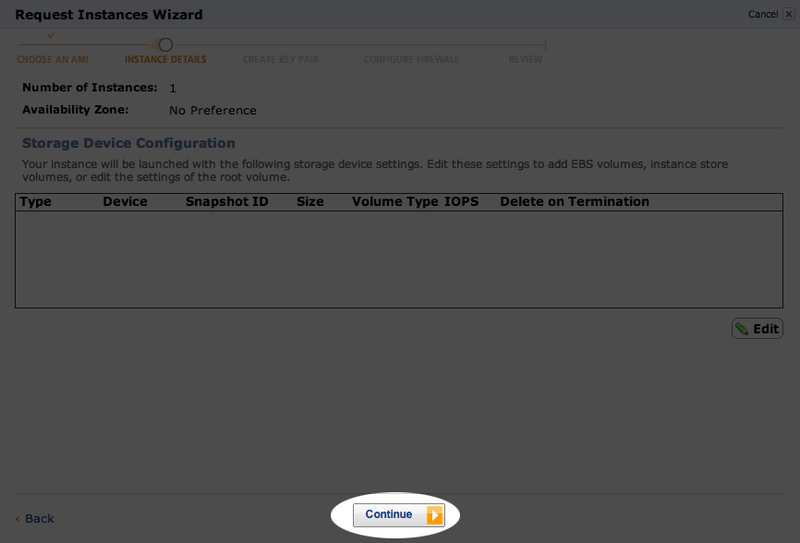 EC2 sometimes cannot meet users demands but retrying will generally work. 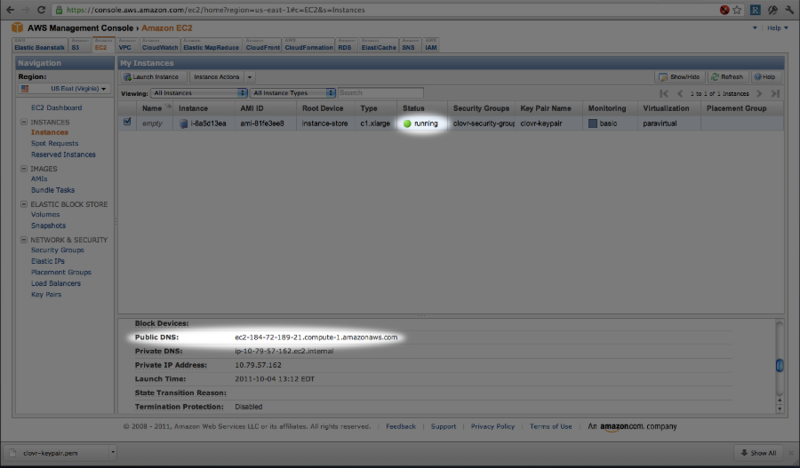 Once the instance is running you can click on it to get the hostname. 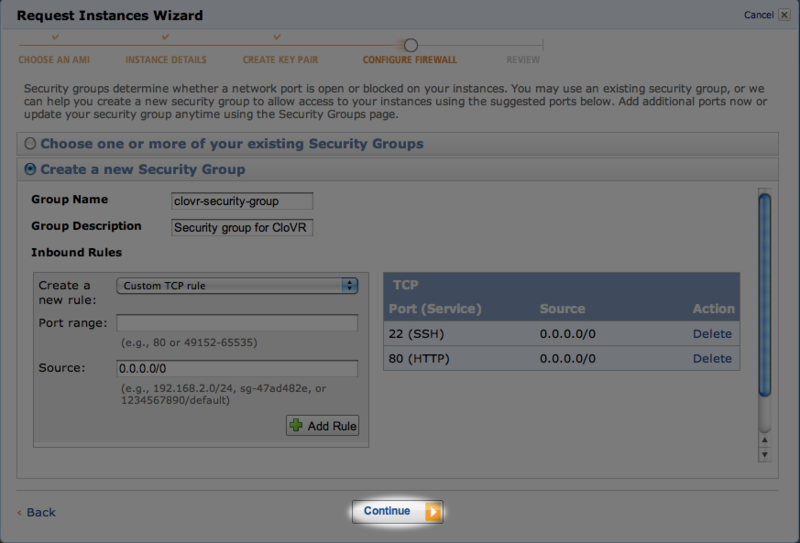 From here you can go to the web gui on that instance and run pipelines. The instance that was brought up has no credentials on it, though. 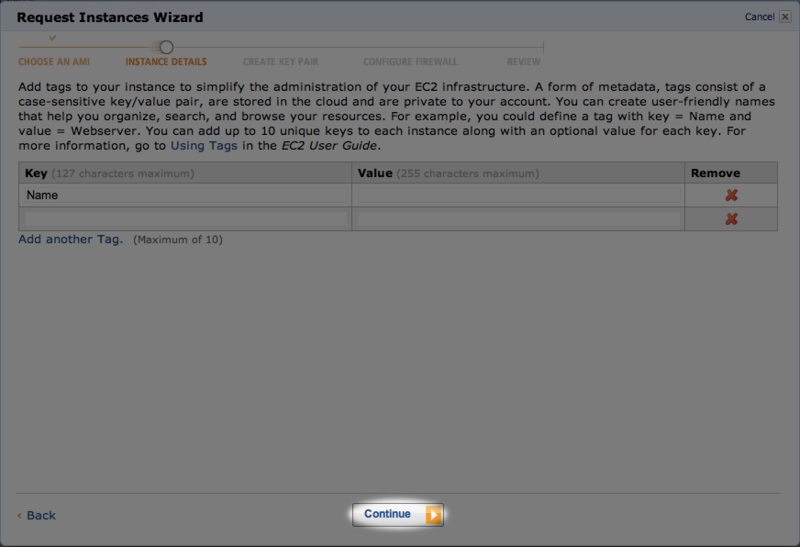 In order to run a pipeline that scales up to your datasets needs you have to add your Amazon EC2 credentials, follow these directions. 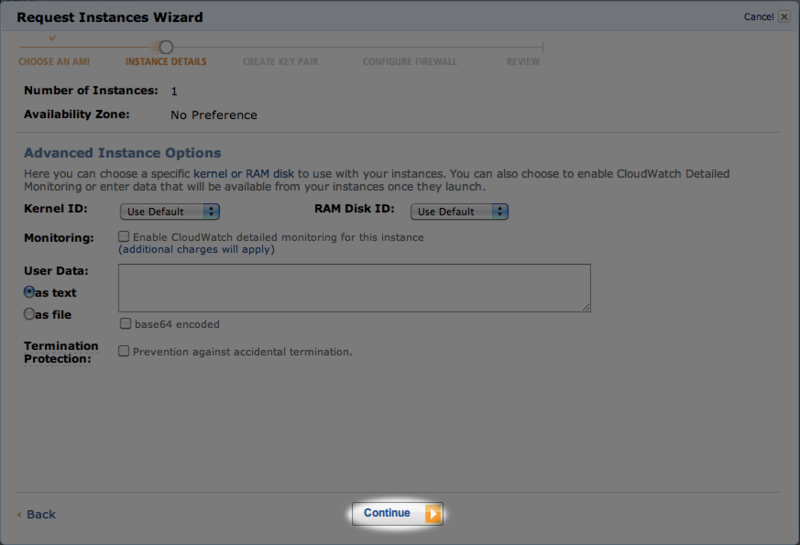 In cloud-only mode it is very important to manage your instances yourself. Because you start the instances the framework assumes that you know best when to terminate the instance. Exec nodes will be autoshutdown, as usual, but the instance you brought up will not autoshutdown. 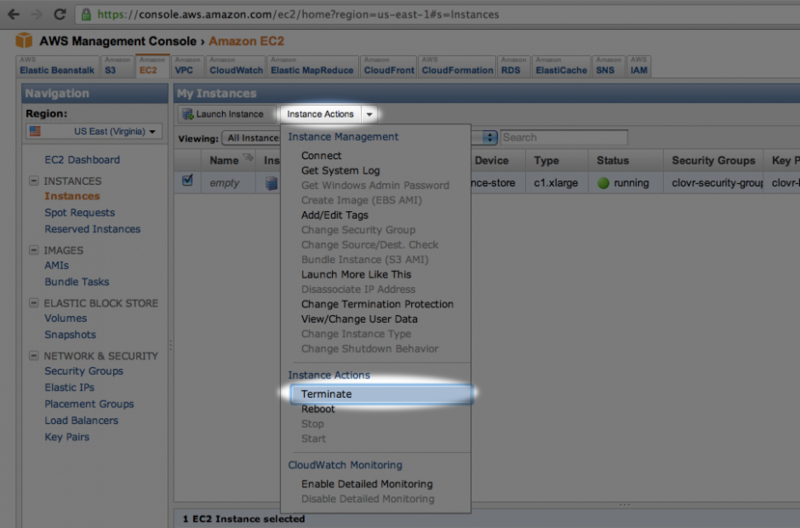 In order to terminate the instance click on it and then click on Instance Actions then choose Terminate.